Woke up this morning to frozen rain drops. 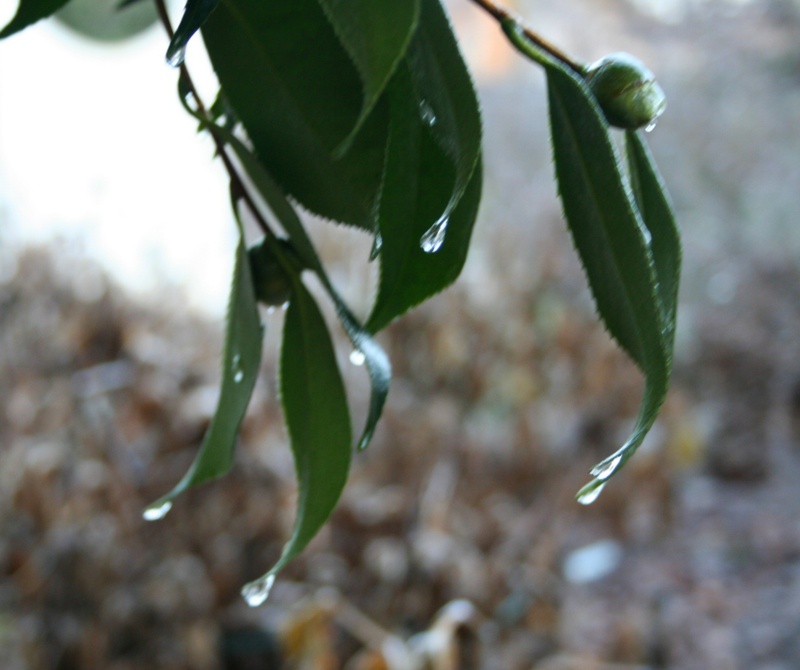 It was not a heavy rain, but just enough to coat the world in slippery ice and leave drops suspended on the tips of the camelia leaves. I had a busy weekend running errands and baking Christmas cookies, but I still had time to look out my front window and count the different birds at our bird feeder. I even tried taking photos of them, but not with any great success. If I open the front door and try to step out onto the steps, the birds are gone. If I try to slip around the back and through the gate, the birds see me and fly. 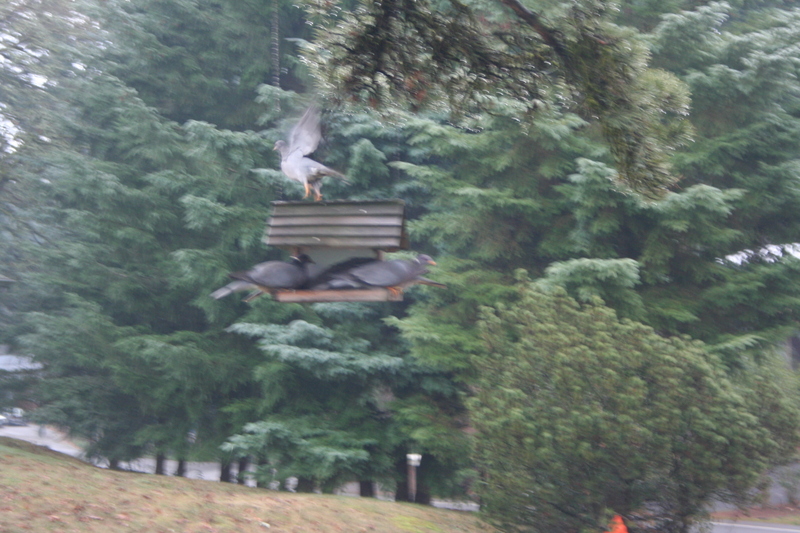 So I try to photograph them through the picture window. Only five band-tailed pigeons came to the feeder and as soon as they saw me at the window with the camera, they were off. They’re so shy! The bushtits were no better. At one time, there were 27 bushtits in and around the feeders. 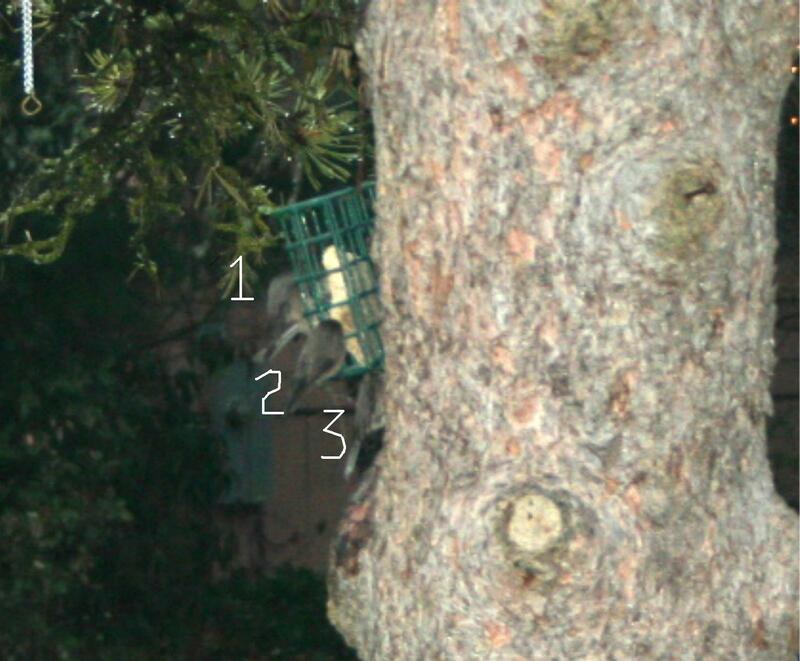 They were not all on the suet feeder at once (only half of them), but they were flitting in and out of the rhododendrons, the seed feeder, and the suet feeder. I counted 27, but there were more: you try to count dozens of tiny little birds moving fast. I counted as many as 14 dark-eyed juncos on the grass, too. I tried slipping out the front door to get a photo of them and they all took off. 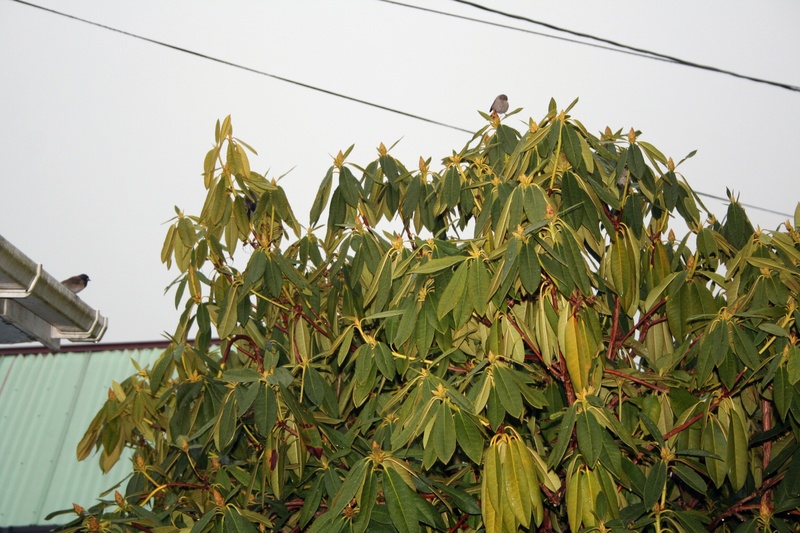 I got the obvious birds in my lens: one dark-eyed junco on the eave and a bushtit in the rhododendron. 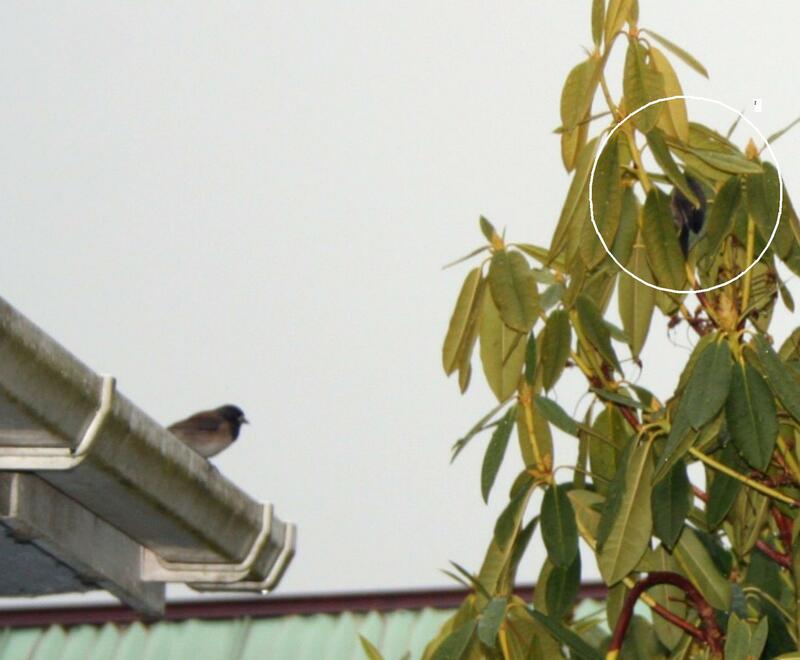 You can see how much smaller the bushtit is than the junco. While it isn’t a quality photo, it is a good size-comparison photo. The junco (which is farther away, slightly) looks twice the size of the bushtit. There really is a bird inside that circle. A little grey fluff of feathers. 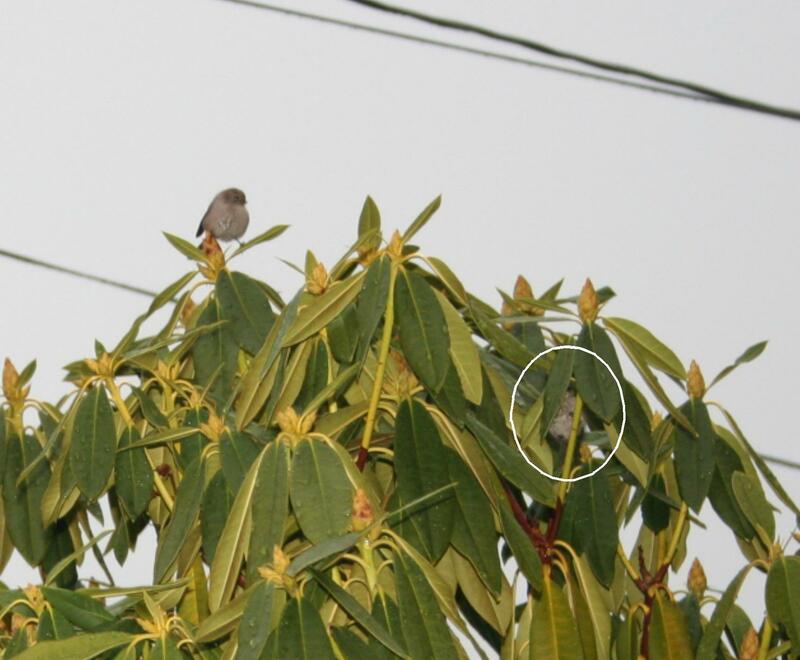 Bushtits are such cool little birds, almost as tiny as hummingbirds, and just as busy, flitting from tree to tree. They just happen to like flying in crowds, so you never see less than ten of them at a time. 27 is not unusual (and there were probably more). Those are some pretty birds and I am sad I could not capture them on film. I need one of those remote digital computer cameras set up to photograph all the wildlife in our feeders. But, all in all, it was good weather for birdfeeding and counting the birds that have come to count on us. Pun intended.